We all know it’s hard to get your book published, but did you realise that only about one in a thousand of the novels written each year are commercially published? I’ve been commercially published myself, and I know a lot of published authors. That experience made me suspect that the classic route to getting your book published – sending an unsolicited manuscript to a literary agent – is a myth. Like the unicorn, everyone has heard of it, but it doesn’t really exist. So, I decided to ask the published authors I know how their books really got published. What everyone tells you is: to get your book published first you need to be a genius. Then, you toil for a decade on your masterpiece. After that, all you need to do is send it, unsolicited, to a literary agency. You write your work of genius. You send it out to literary agents. A literary agent takes one look at it and agrees to represent you. The literary agent sends the book to the major publishers. The publishers fight over the book. The agent negotiates a million-dollar contract with the highest bidder. The publisher publishes the book. It sells eleventy zillion copies. If you believe this is how publishing works, Kafka would like a word with you… as would all the other unpublished geniuses. First, though some people are more talented than others, there’s no such thing as ‘genius’. 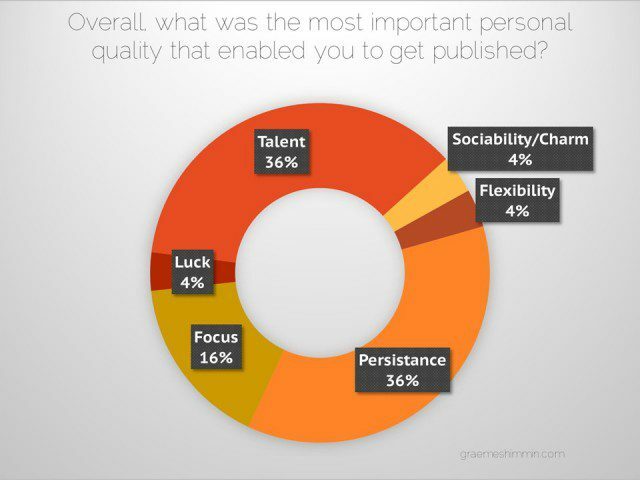 ‘Publish-ability’ is not something that a few gifted people possess and that the rest of us can never hope to achieve. That’s the good news. The bad news is, the aspiring author usually fails at step three – they send their manuscript out but it’s rejected by all the literary agents. My understanding is that literary agents reject over 99% of the unsolicited submissions they receive. I’ve heard many anecdotes. Manuscripts that simply didn’t receive a response. Interns whose job it is to go through the incoming ‘slush pile’ sending form-letter rejections. Manuscripts being sent back seemingly unopened. Etc. Etc. For the few authors who do get an agent, the other common failure is that all the publishers reject the agent’s submission of the book. Manuscripts sent to publishers by agents will at least be considered, but, even with agents filtering 99% of submissions out, publishers still receive many more manuscripts than they can possibly publish. 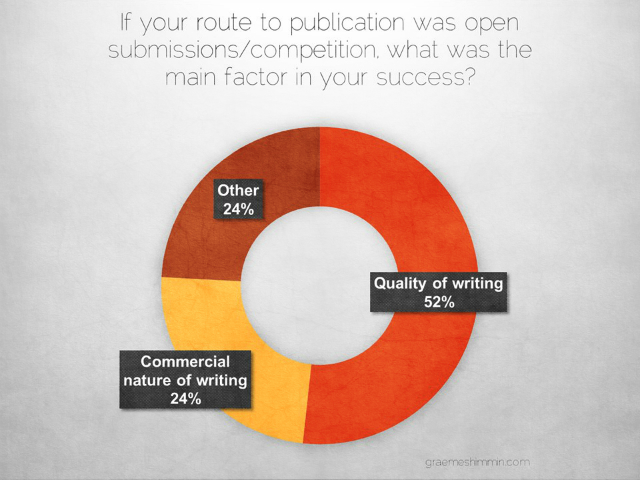 The odds of the publisher making an offer are still less than 10%. So, if the chances of getting your book published the classic way are tiny, how do books really get commercially published? I’m part of a commercially published authors’ group called The Prime Writers. I asked them, and every other commercially published author I know, to fill in a survey about how they got their book published. Literary agent Juliet Mushens also generously agreed to ask all the authors she represents to respond. There were ten questions and over a hundred and fifty commercially published authors responded. In fact, the main response to the question “How did you get your book published?” was “other”, and the authors who ticked that option explained the routes that they took. They had tales of struggling for years making slow progress, raising their profile, suffering rejections and building up contacts. Many authors had written several unpublished novels before making their breakthrough. The authors had stories such as “I was shortlisted for a competition. That led to meeting a literary agent at the award ceremony who said they’d look at the manuscript. Then a contact in publishing heard the agent had requested the novel, so asked to see it. In the end, they decided it wasn’t right for them, but they passed it on to a different editor. In the meantime, the first agent had rejected the novel, but a second one was now interested…” etc. etc. Though the stories were complicated, it seemed like they all had a key moment. I assigned the stories to the main options depending on what that key moment was. 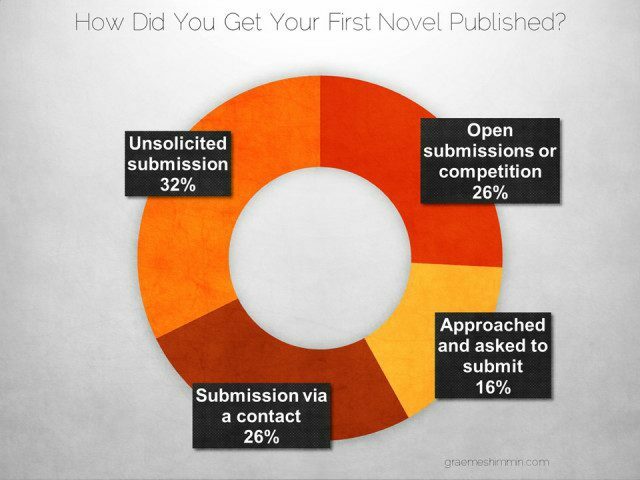 We can see that only a third of authors got their book published through the classic route of unsolicited submissions. That might seem like a reasonable percentage, but we need to consider ‘survivor bias’ – the survey was only answered by published authors, so excludes everyone who failed to get published. 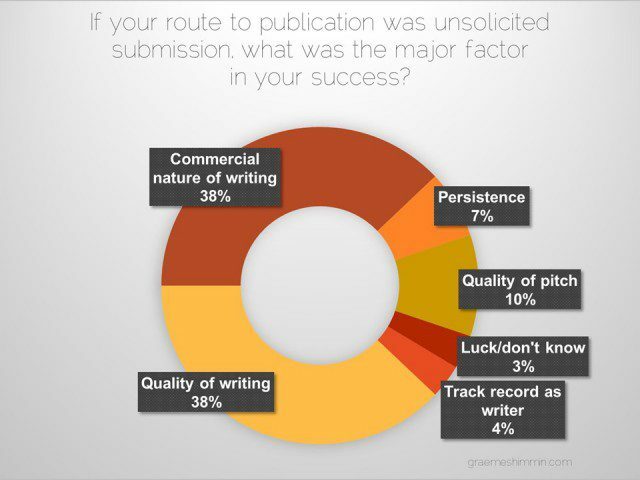 Even without that, two-thirds of authors didn’t get their book published by the classic route. What then did they do? Just over a quarter of the authors in my survey mentioned that winning or being shortlisted in a competition was the key event that enabled them to get their book published. This route works. It’s not easy, because inevitably there’s a huge amount of, well, competition. That makes entering competitions a bit of a lottery. Have a look at the winner of a competition and the shortlisted pieces ­­– there’s usually no discernible difference in quality. With such fine margins, to win a competition your work must be superb and exactly the sort of thing the judges like. When you send in what you think is your best story ever and the judges reject it it’s disheartening, but what rejection isn’t? Having said that, a lot of entries to any competition aren’t particularly good, so getting shortlisted is more realistic. If you want to get your book published, you’ve had good feedback on it and polished it up to be as good as possible, submitting it to competitions is something you need to seriously consider. Sixteen percent of the authors got their book published because an agent or publisher approached them and asked them to send them their manuscript. What? The agent approached them! I thought agents were unapproachable unicorns? How did that happen? It’s all about profile. Somehow, you have to become well-enough known to the agent that they decide to contact you. It seems that to give yourself a chance of being approached by an agent you should get to know them by working together. Arts organisations and academia regularly invite agents to speak, hold seminars and act as an external voice, so volunteering for things like literature festivals might give you an opportunity. An agent approaching you is, inevitably, out of your hands, but building up your profile can’t do any harm. My survey data clearly showed that contacts are important. 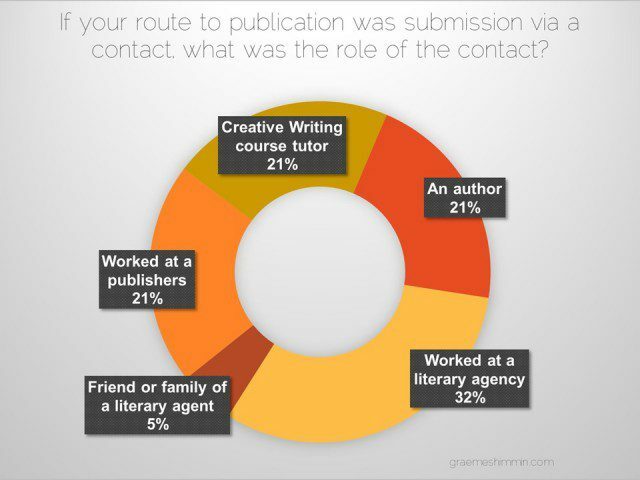 Over a quarter of the published authors relied on contacts at some point to get their book published. That’s because the aphorism, “it’s not what you know it’s who you know,” applies massively to getting published. Book publishing runs on connections and networking, from end to end. 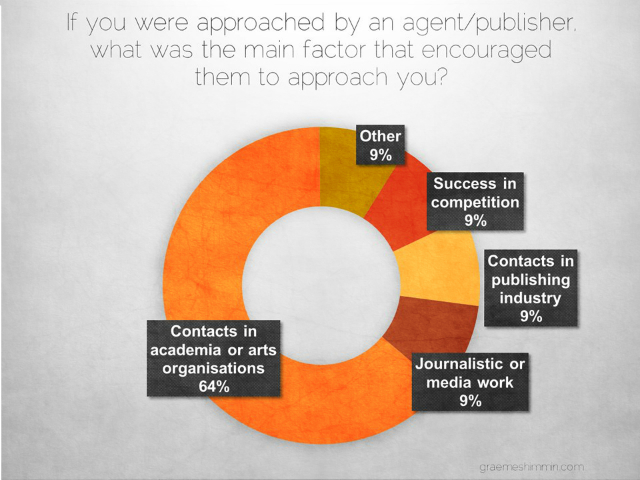 Over half of these authors had a contact inside a literary agency or publishers. Another fifth had a contact who was a published author. How did they get these contacts? Networking. Another fifth of the authors relied on contacts from a creative writing course. Many creative writing tutors act effectively as ‘scouts’ for the publishing industry – passing on manuscripts they rate highly. So, if you want to get your book published, networking to build up your contacts is vital. 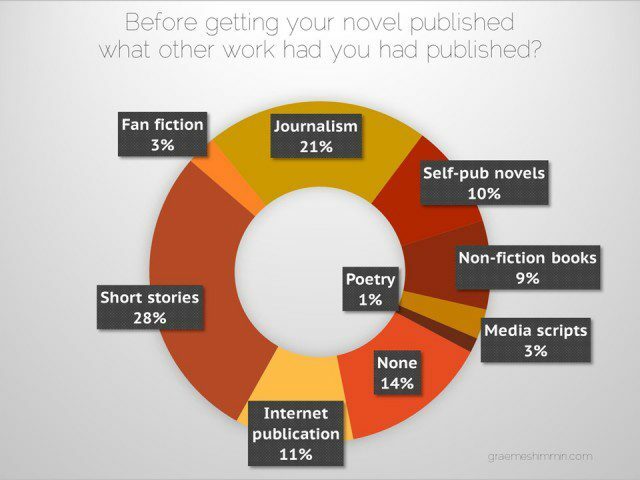 Nearly a third of the authors in the survey got their novel published through unsolicited submissions, so it is possible. Two factors stood out here: quality of writing and writing commercial work. If you’re determined to approach agents with your work then my article on writing an irresistible elevator pitch will give you the best chance of getting a response. But, however good your pitch is, in the end it’s your work that the publisher buys. It’s interesting that the authors were evenly split on whether the pure quality of their writing or the commercial potential of their book was more important. Commercial potential is something that I feel a lot of aspiring authors tend not to put enough weight on. So, if you’re trying to get your book published via unsolicited submission, think about how you can increase its commercial attractiveness and how you can emphasise that attractiveness in your pitch. 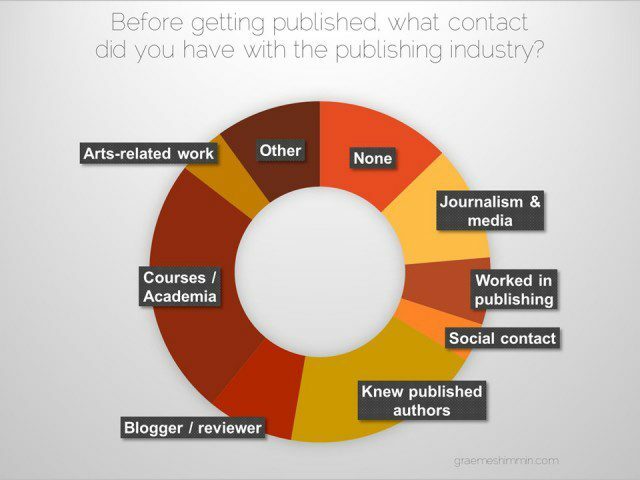 I think the important thing to note here is how few published authors had no contact with the publishing industry. Again, that’s because book publishing runs on connections and networking. Without that network of contacts you are on the outside. I seems clear that when you’re trying to get your book published, getting involved in the literary world is a major predictor of success. A large number of published writers had done creative writing courses of some sort. 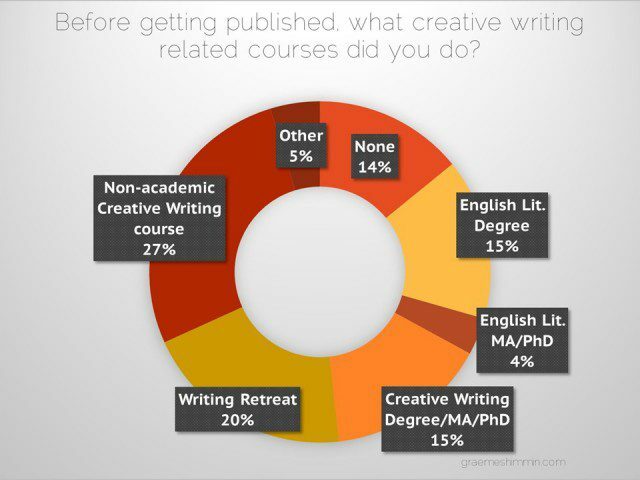 Only fourteen percent of published authors hadn’t done a creative writing course. However, most of the published authors had done non-academic courses or writing retreats, rather than degrees or postgraduate qualifications. So, consider doing a creative writing course – it certainly appears to help your chances of getting published. Almost all the authors had some other work published before they got their novel accepted. Only fourteen percent had no previous publication. I suspect the reason for this is that like doing a creative writing course, previous publication gives you a level of credibility when you send your work out. The classic route to building up a track record of publication is to get short stories published in magazines. Nowadays though there are other options, like internet publication, self-publishing and fan-fiction. The other main route is journalism. Again, these days, doing journalistic work is not difficult. Getting paid to do journalistic work is almost impossible, but anyone can have a blog and almost anyone can get articles published on websites. So, dust off those short stories and articles, or write some new ones, and get them out there. An interesting and somewhat paradoxical result compared to the previous questions. 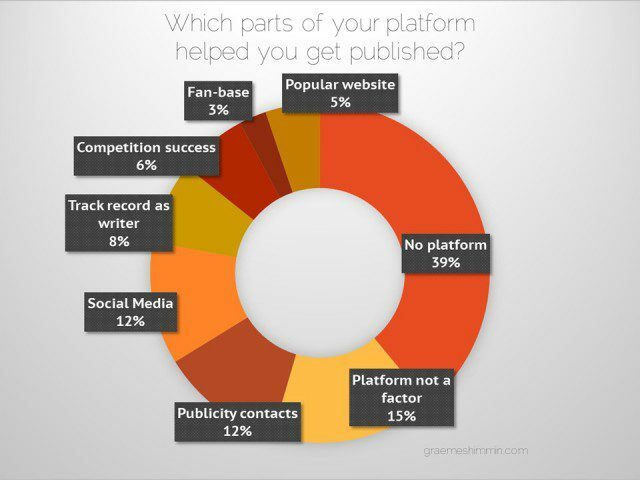 More than half of the authors felt that they either didn’t have a platform or it was unimportant. A ‘platform’, if you don’t know, is your position, popularity, following, reach or fame – anything that gives you a ‘guaranteed’ ability to sell books. It seems then that having a platform is not a critical factor when you’re trying to get published. As an unpublished author you’re almost guaranteed not to have that big a platform, unless you’re famous for something else. Perhaps publishers recognise this. Still, nearly half the authors did have a platform of some sort, so there’s no harm in trying to build one up, especially as it’s a byproduct of doing other things that do seem to give a positive effect, such as entering competitions. But don’t spend your life building your Twitter following – it doesn’t seem to help. Clearly the authors in the survey are not shy about their talent, but they also recognise that getting published is about persistence too. This comes back to my point about Kafka, and the other unpublished geniuses – talent alone isn’t enough to propel you to publication. Remember as well how the main response to the question “How did you get your book published?” was “other”. Many of the authors had struggled for years and had written several unpublished novels before making their breakthrough. So… a simple lesson here – keep trying! Build up a track record of publication. Get involved in the literary/publishing world. Write work that has commercial appeal. 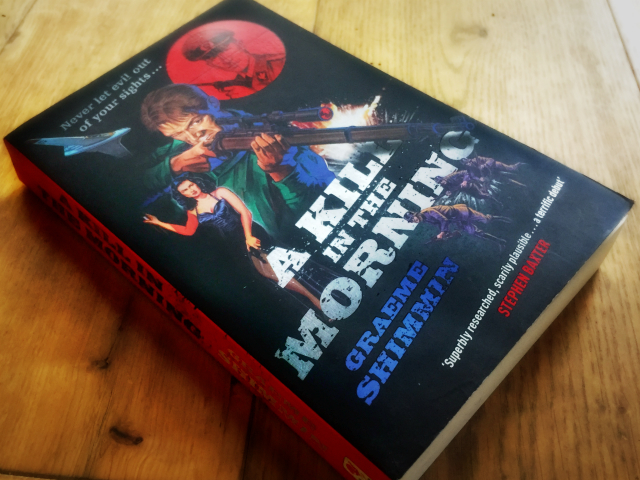 My own route to publication was a competition – my novel A Kill in the Morning was shortlisted for the Terry Pratchett Prize and that attracted my publisher, Transworld, to buy my novel. If you’re a commercially published author and would like to share your experience of how you got your book published, please email me. Otherwise, please feel free to share the article using the buttons below.